Narayana gave a nice speech, posted here, in Marquette, Michigan. I had to look this up on the map - it's in the UP (upper peninsula) of Michigan which, as everyone should know, falls within the 9th Federal Reserve District (Minneapolis). From our point of view, there are two important issues raised in Kocherlakota's speech, relating to labor markets and the Fed's balance sheet. Beginning in June 2008, this stable [Beveridge curve] relationship began to break down, as the unemployment rate fell much faster than could be rationalized by the fall in the job openings rate. Over the past year, the relationship has completely shattered. The job openings rate has risen by about 20 percent between July 2009 and June 2010. Under this scenario, we would expect unemployment to fall because people find it easier to get jobs. However, the unemployment rate actually went up slightly over this period. Another way to look at this is to take a standard Mortensen-Pissarides matching function and use that to interpret the data. Suppose that we assume a Cobb-Douglas matching function, with a "share" parameter for unemployment of 0.75, as in Shimer's 2005 AER paper. Following a quick-and-dirty approach, which ignores the not-in-the-labor-force state, various time-aggregation issues, and different units of measurement for the unemployment rate and vacancy rates (all dealt with in Shimer's AER paper, for example), I calculated a "productivity" residual from the assumed matching function and the vacancy/unemployment data for December 2000 to June 2010. Assuming a constant separation rate of 3% per month, I get this picture. What we get is a measure of matching efficiency in the labor market, analagous to calculating a Solow residual. The picture tells us that, given the same unemployment rate and vacancy rate, the US labor market currently produces about 45% fewer matches of unfilled vacancies with unemployed workers as it did in early 2007. This is a phenomenal shift and, of course, it would be very useful to understand why this has happened. One possible explanation is that this is just a measurement problem. In terms of matching in the labor market, all we can measure are reports about the number of economic agents who are searching on either side of the market. We do not measure search intensity. One explanation for the current anomalies in the Beveridge curve relationship, and in the chart, could be that firms are posting vacancies but are not very serious about filling them, a view that I have heard attributed to John Haltiwanger (though I haven't verified this). This I agree with completely. But we could go further. Fiscal policy - at least the short-term stimulus that Krugman has in mind - can't transform construction workers into manufacturing workers either. The role for government here has more to do with long-run educational policy and social insurance. Perhaps surprisingly, mismatch has not been studied extensively (to my knowledge) in macro/labor economics. Shimer has a somewhat stylized model of mismatch here, which doesn't quite get at the sectoral production issues I have in mind, but certainly is a good start. Conventional Mortensen-Pissarides search models, while seemingly motivated by heterogeneity in the labor market, avoid it altogether. Typical Mortensen-Pissarides workers are all identical, as are the firms, and the friction in matching them is all embedded in the matching function - a non-structural object if there ever was one. This can't be very helpful in addressing the current mismatch issue. But the MBSs do have another kind of risk called prepayment risk. If long-term interest rates are low, then many people prepay the mortgages in the MBS. The owners of the MBS—in this case, the Fed—get a large coupon payment and the MBS’s principal falls. However, if long-term interest rates are high, then few people make these prepayments. The Fed announced that, rather than letting the mortgage-backed securities (MBS) on its balance sheet run off as they mature (or are prepaid, or defualted on), it would replace them by US Treasuries, keeping the size of the balance sheet constant. Kocherlakota says (and I had not heard this before) that this was in response to prepayments of the underlying mortgages in the MBS. 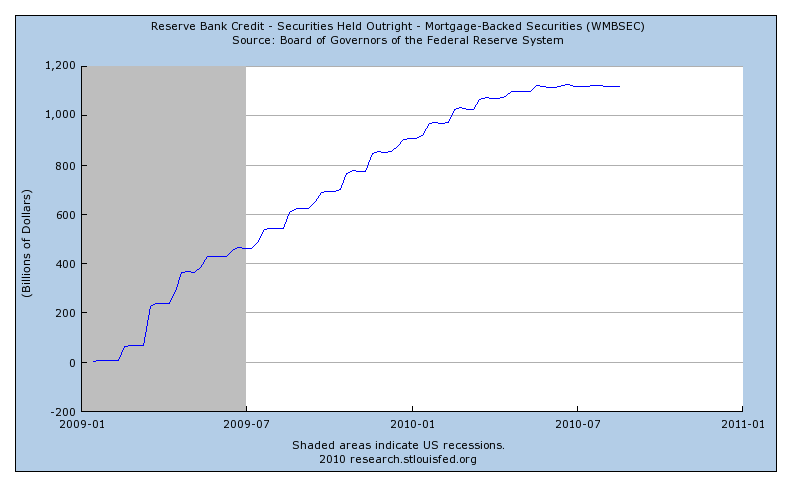 This is a little puzzling, as in the next picture, you can't see any reduction in the the Fed's MBS holdings. 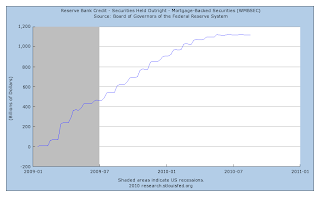 Maybe there is a lag in how this shows up in the published statistics, or maybe the Fed anticipates a reduction? Anybody know? In my view, this reaction is unwarranted. The FOMC’s decisions were largely predicated on publicly available data about real GDP, its various components, unemployment, and inflation. I would say that there is no new information about the current state of the economy to be learned from the FOMC’s actions or its statement. The Fed does not know more than the rest of us do. As well, the implications of the Fed's announcement are very small. The Fed has announced that they are going to keep something constant - the nominal size of their balance sheet - for the time being. Otherwise, this nominal quantity would have been falling very slowly. Even if the outstanding liabilities of the Fed are constant in nominal terms, they will be falling relative to total nominal GDP, and so the Fed's interventions will ultimately unwind (after a long time of course) even if the Fed does not change policy from what it just announced. "The role for government here has more to do with long-run educational policy and social insurance." Even if what you're saying about mismatch is true (to the great extent you're saying), and I'm not saying it is, then you should come out strongly for far greater spending on education, training, and social insurance. How about extensive programs to allow the unemployed to go to college or vocational training, covering tuition, and living expenses, adequately, without giving them crushing debt. Wouldn't that be a lot better than making permanent the Bush tax cuts for the rich? It's gotten immensely harder for even single youngsters to afford to go to college after a generation of Republican dominance. How about coming out for a return to the generous college aid and subsidization of a generation ago, or better yet, free universal bachelors degree or vocational education, as well as free universal pre-school . We've been stuck at only free K-12 for a century, in which time the need for education to be highly productive has skyrocketed. Let's take as given that it's essentially impossible to squeeze more tax revenue out of the American public. Do you think it would be politically feasible to reallocate resources from the Pentagon and prisons to education? I would be all for that. Why would you assign a share of .75 to unemployment in the matching function? When I actually fit a matching function to the data, I get a less than zero share for unemployment. Even if I exclude the last 3 years, I get a zero share (actually still slightly less than zero, but the coefficient is not statistically significant, so I'll exclude the term on the grounds that it has the opposite of the theoretically predicted sign and therefore we can attribute the coefficient to noise). The residuals from this empirically fit matching function, giving a zero share to unemployment (leaving us essentially with the ratio of hires to job openings as the residual), show an overall upward trend. 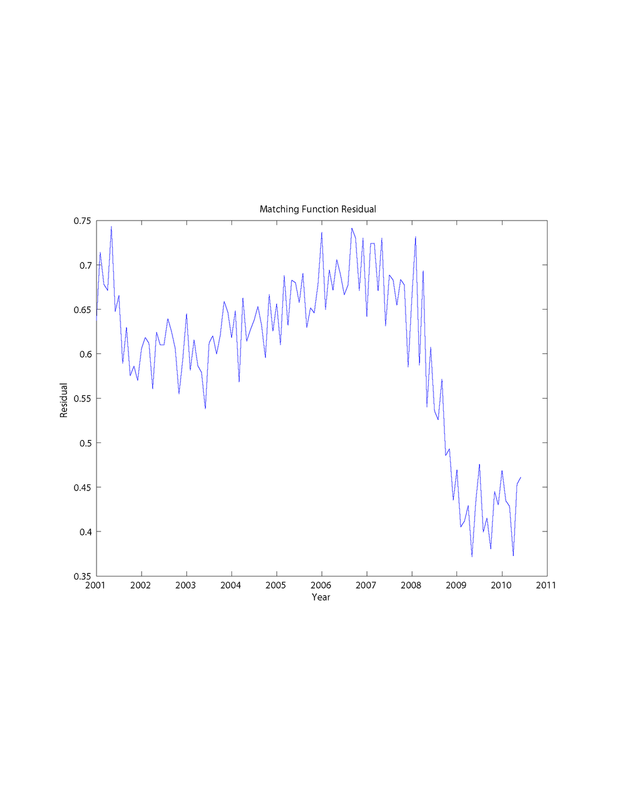 They have declined a bit over the past year but remain far above where they were in 2007. Like I said, what I did here is quick and dirty, and by no means definitive. 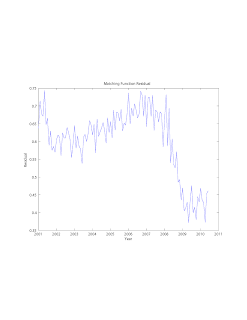 I just used Shimer's estimate of .75, which came from estimation on the data he used. If we want to get serious about the empirical work, we should be trying to estimate a structural model based on heterogeneity and matching - a lot of work to do there. "Do you think it would be politically feasible to reallocate resources from the Pentagon and prisons to education?" A general answer is that this (to at least some extent), and so much else, becomes feasible if Democrats abolish the filibuster, which can actually be done with just 50 senators and the VP. Until very recently, the filibuster was only used very rarely; that was the informal custom. Now it's standard that anything big requires a supermajority. With the filibuster abolished, so much becomes possible. Cap and trade could pass and eventually become a huge source of income that could fund education, alternative energy and other high return investments. So could tax hikes on the rich, and a VAT. Of course the Democrats are living in fear of the midterm elections, which constrains what they do. After those elections, you are unlikely to see any of these things going anywhere. "This I agree with completely. But we could go further. Fiscal policy - at least the short-term stimulus that Krugman has in mind - can't transform construction workers into manufacturing workers either. The role for government here has more to do with long-run educational policy and social insurance. Perhaps surprisingly, mismatch has not been studied extensively (to my knowledge) in macro/labor economics." Let's hear the opinion of the person who has the most power to act on this today, Ben Bernanke. Of course Bernanke today seems to be not acting in accordance with many of his past stated opinions.